With our training cancelled due to a local strike, we took the opportunity to walk to Durbar Square in Patan, one of the seven World Heritage sites in Kathmandu. The roads were so empty that a group of young boys was playing a football game on one of the busiest highways, where usually you dice with death to get across. Oh, so quiet too, no car and bike horns, roaring traffic or people shouting. On reaching the site we were accosted by the caretakers demanding money, 500 rupees (£3.50), as we were tourists. On telling them that we were volunteers, they kindly issued us with tickets lasting for our 2 years! 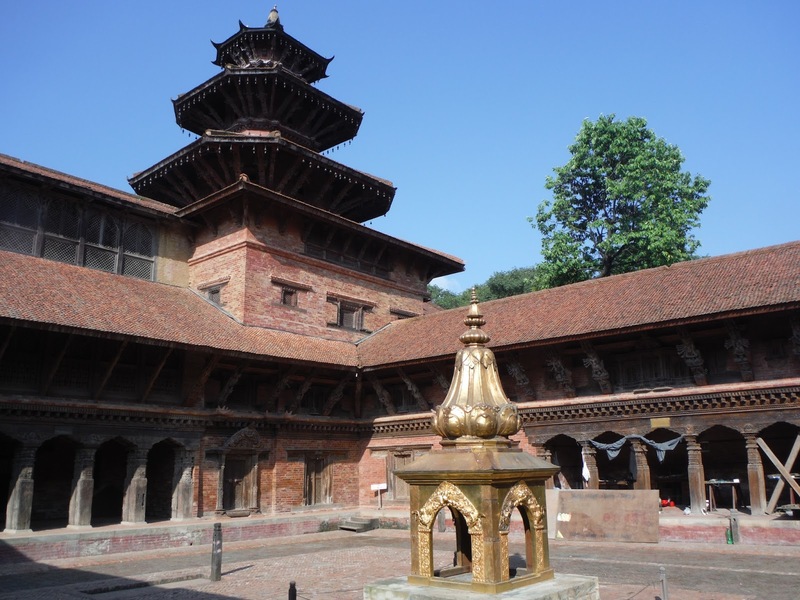 The palace is extensive with several courtyards and interconnecting wings. 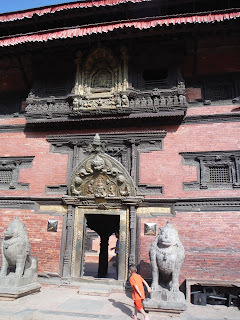 The many carved wooden windows, doors and roof supports are all intricately decorated. 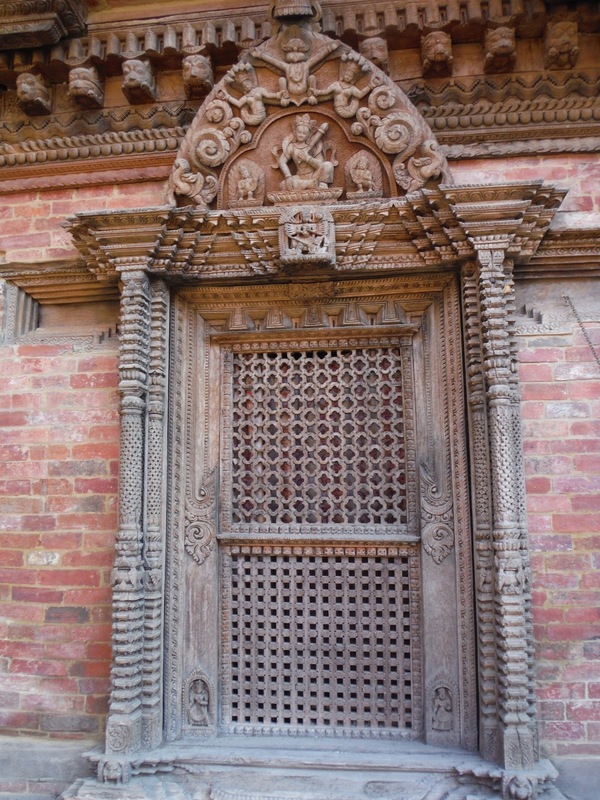 Some of the courtyards have statues of Hindu gods and goddesses set into niches in the walls. 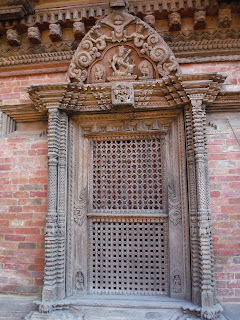 Beautifully carved decorative doorway at the Royal Palace. 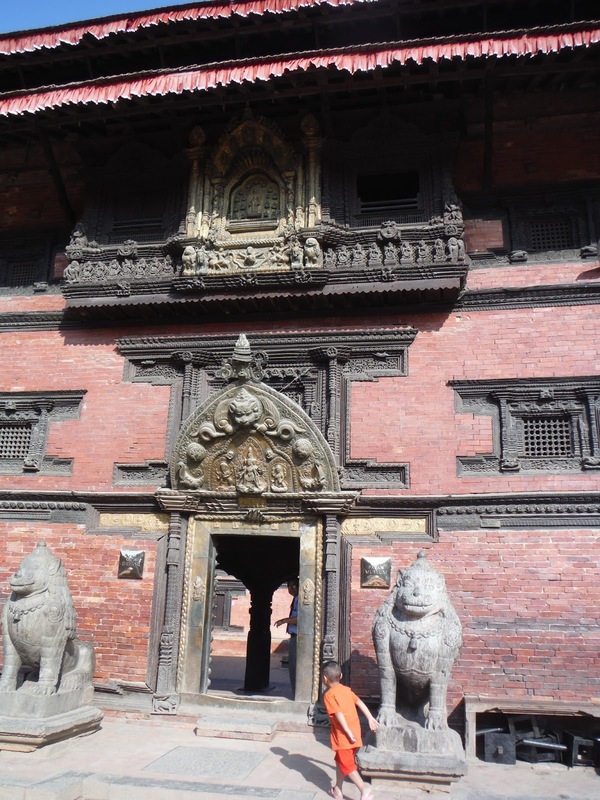 On one side of the square is a richly decorated Royal Palace, built originally during the seventeenth century, but much of it required rebuilding after the earthquake damage of 1934. Five tiered Mandirs can be seen on the opposite side of the square, the oldest dating from 1565. 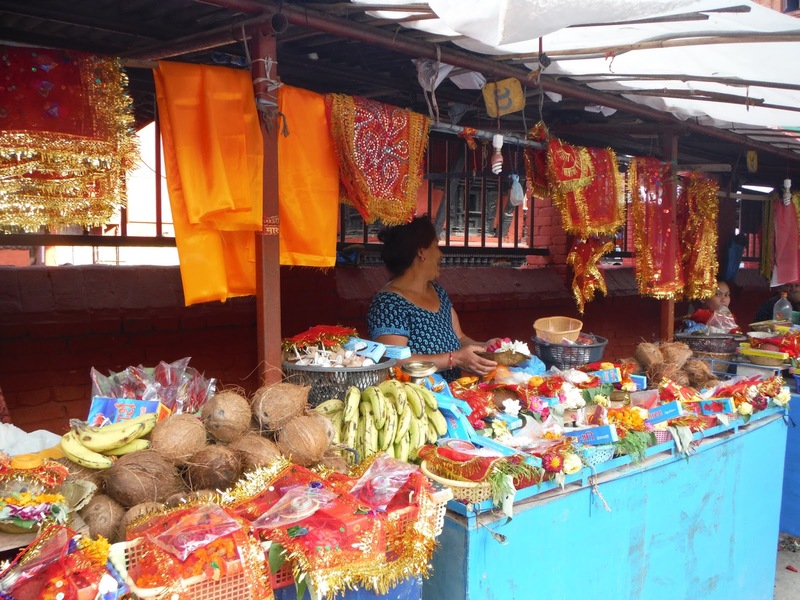 Near the temple are colourful stalls selling goods for offerings to the Gods; bananas, coconuts, tinsel, and beautiful little dishes made of leaves onto which are put marigold flowers, seeds and rice. 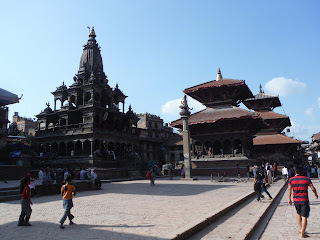 There is so much to learn about Nepal, its rich history and culture, I am sure to return to these beautiful old buildings in the square many times during my next couple of months living in Kathmandu. look forward to your posts . nothing to report here just autumn weather arrived. todd still barking at me i will say hello. Maybe Todd commenting on Whinge's pins or his poem in hash mag ref Lucious! Love blog & pics. V.evocative. Hashed 4 times so far - shaved 5 mins off back to bucket time at Walreddon and in before time of 9.10 achieved (?) on the prev 2. At this rate will get red-carded. Even google got it infamy (sic) when I put in 'Aitch' it suggested 'Witch'. Honest guv that eye of newt and toe of bat cocktail was purely medicinal. Keep up the blog Ann - brills!